There's something to be said for judging a movie by the length of time you spend thinking about it. By that measure, Bus 174 is a very good movie. I can't quite get it out of my head. 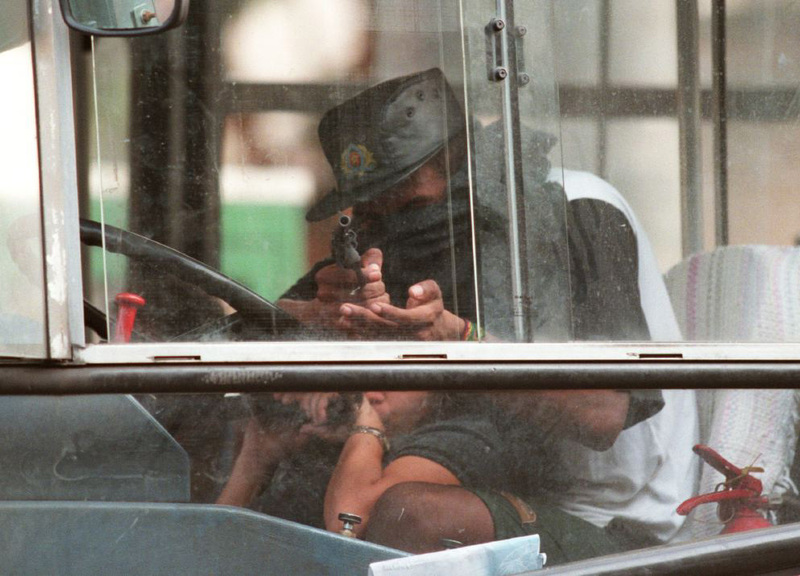 Bus 174 is a documentary of a bus hijacking that occurred in Rio de Janeiro in 2000. If you're like me, you were never aware of this event. The instigator, Sandro do Nascimento, is a 21-year old street kid. His mother stabbed to death in front of him as a little boy, Sandro ends up living in the streets, addicted to glue and cocaine, committing crimes to stay alive, living in and out of jail. He eventually finds himself, I almost suspect unwittingly, as a hostage taker on a public bus as he's trying to commit a robbery. All of this is broadcast on Brazilian television. To give away the ending would undermine the power of the documentary. The director ties both live footage of the hostage situation with interviews to provide a backstory about Sandro. The climax is masterfully presented. The director has a clear intent here and it is slightly heavy handed; Sandro is a product of his environment - an oppressive jail system, a lack of social welfare, a society that ignores these kids, and a undertrained and abusive police force. This is the kindling that led to this event. The director is somewhat successful. You can't help but feel some empathy for Sandro. He doesn't strike the vicious pose that you'd expect from a hijacker except when he's taunting the police. Interviews with the hostages seem to suggest he was acting the way he was more as a rebellious statement to 'the man' and was uncomfortable with the fact that it involved innocent people. But the movie isn't without flaws. The director's approach is heavy handed at times. There is very little information on how bad the street crimes that the kids commit are. No statistics or sense of the crimes. When I spent about a year in Brazil it was made abundantly clear to me that the possibility of violence was something you needed to pay attention to. During one business meeting I was in, 3 bank robbers were shot to death in a bank located in the lobby of the building. Also the scenes are contrived at times. The worst being a scene with criminals locked in a disgusting jail, talking about the grievances of the penal system. First the director uses the film negative which casts the prisoners in an almost devilish image. He ironically makes them seem inhuman. Second, the jail wasn't a jail. It was really a re-enactment. But that isn't clear from watching the movie. Nevertheless, the theme that made me keep thinking about this movie isn't one I suspect that the director was interested in showing. It's clear the director, at least on some level, views Sandro as one of the victims. Perhaps not the primary one but a victim nonetheless. The theme that impacted me was rather "where do you assign blame in this event?" Who is responsible? It's a very human instinct to want to point at someone after an event like this and say, "There he is. He's the one that caused this." But it's not easy with this film. It all comes off as a lose-lose-lose situation for everyone involved. In that sense this is one of the more depressing films I've ever watched. Is Sandro the bad guy? He's the most likely candidate. Given his background it's a wonder he didn't do worse things. And besides what good does that do you to identify Sandro as the bad guy if your country is seemingly churning out Sandros in a way that would make Henry Ford proud. Is it the police? They are also a likely candidate given their behavior. Their professionalism borders on disgusting. For most of the movie you are just bewildered by their actions. But given their training and the reasons they took the job (they couldn't find another one), it's a wonder that the outcome wasn't worse. How can you blame people who should never have been given a badge and gun? How about the government? One disappointing aspect of the movie is the complete lack of interviews with senior officials. Either those directly involved in the events or those who are in charge of things like police training or social services. You can only guess at what they might have said. Was it their fault? Given the incredible inflation in Brazil it's a wonder the country didn't go bankrupt. How is the social services department or the police training department do anything with worthless reis? Couple that with the rampant political corruption and it's not clear who the finger should point at. And so you keep ruminating on the movie. You're left with nothing except for an unsatisfying feeling that the situation is more complex than the movie lets on and that there are no obvious solutions. Perhaps no unobvious ones either.